18th Canadian Battalion in front line at Calonne II sector. On the night of December 1/2 a minor operation was directed against enemy working party. 1 o.r. admitted to hospital. A Minor Operation will be carried out by the 18th Cdn. B’n. against the enemy working parties in from of his trenches from M.10.c.1½.5 to M.10.c.4.9½. The objective of this raid will be to cause the enemy casualties and to endeavor to obtain identification. The patrol will consist of 25 men including a Lewis Gun and Crew. The party will be divided into two groups. The advanced group will consist of one Officer and 10 men. The second group will form a covering party with the Lewis gun on a flank and consist of 11 men under an N.C.O. White tape will be laid by the flank man on the advance group in order to guide the parties back to our trenches and alternate green and white flares will be fired from Very pistols as an extra precaution. 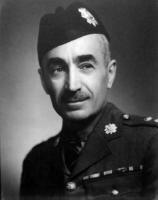 18th CANADIAN BATTALION, OPERATION ORDER No. D-1 Secret for operation on night of December 1/2. Report on Minor raid, Night of Dec. 1/2. Our patrol advanced withing short distance of the enemy wire but no party were there, so we lay in wait for several hours hoping it would appear. In the shell holes were signs of occupation by enemy covering parties as foot prints and [cylindrical] sticks were found. Enemy were very nervous and put up many flares and fired twice on our patrol. 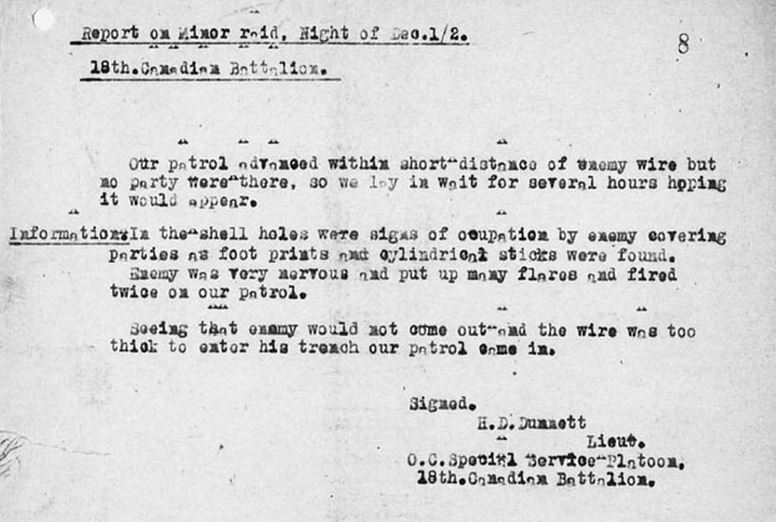 Seeing that [the] enemy would not come out and the wire was too thick to enter his trench our patrol came in. 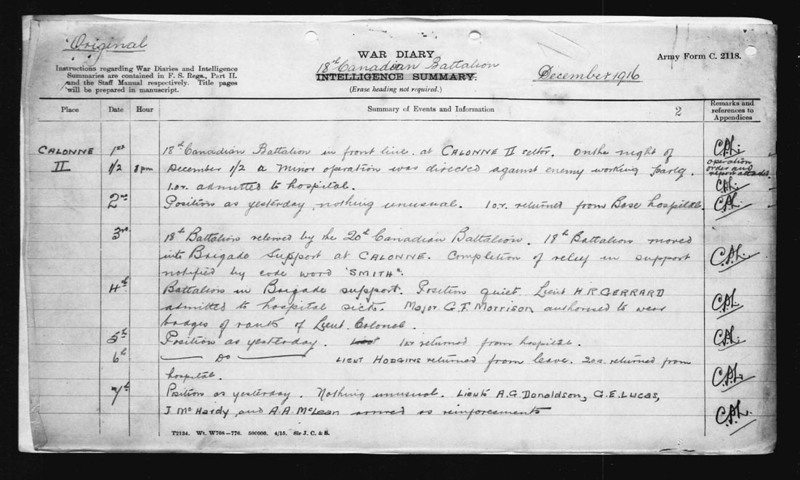 Report of action by Lieutenant Dunnett. 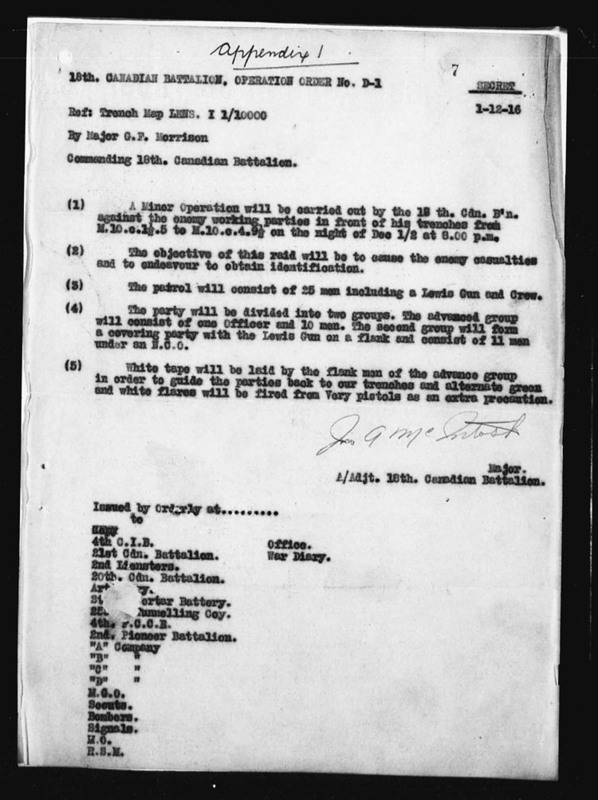 Of interest is the reference to a “Special Service Platoon” which indicates that these soldiers were considered for their skill and aggression for this type of dangerous duty. If interested please read more about the Canadian style of trench raiding here. 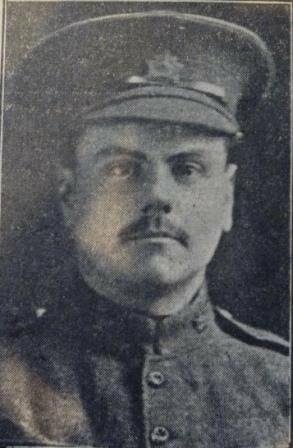 Possible image of Harry “Douglas” Dunnett found at the the Elgin OGS Web Site.